Unknown source: "I'm glad this happened..."
How many technology webinars...are you invited to? Do 1900 dealers need 500 webinars? How many managed print services training classes...even come close to connecting with your reality in the field? How many managed print services programs...teach their views, contradicting or repeating what you already know and may even do already? Leaders are able to discern what's sustainable and valuable from the past and what's not. It is the will of leaders to align, focus, and build cadence, while releasing expectations, tendencies to copy, compare and compete with others. Those behaviors are survival, reptilian and short-term ways of the past; weak and unsustainable in an increasingly innovative world. True story. There is a guy in the industry that serves as a leader for copying others. He copies ideas, conversations, presentations, web sites, and even locations for training with hopes of being more than he is. 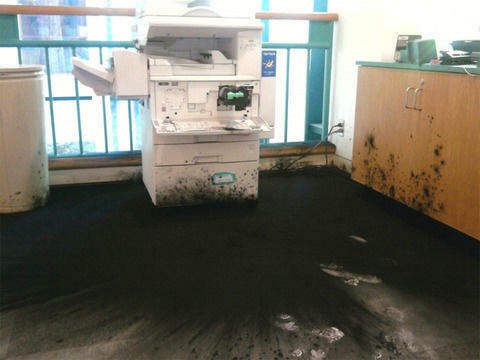 We'd like to thank him for being so ostentatious in his copying. He's helped us in some sort of backward way. Have you ever seen a copy come out better than the original? No. 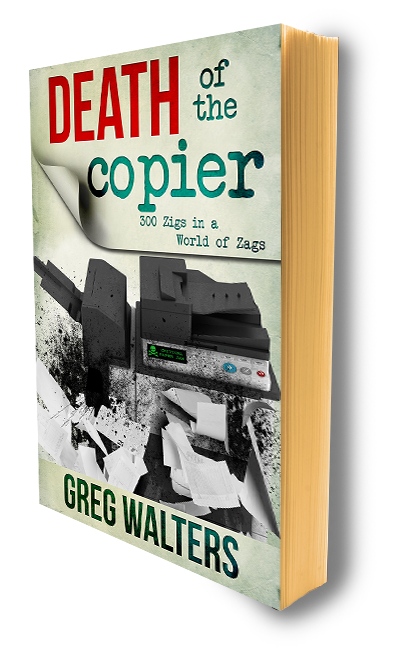 It's time for the death of copiers all around. Not just the machines, but how we behave, lead, act, and what we do. We're tasting a bit of our own medicine, and becoming uncomfortable. It's time to kill, and experience the death of the...mundane. No more webinars, training classes, programs, conferences and shows pushed out to the masses. We'll work one to one or one to a few. If you are a company that hosts trade shows, your revenue streams may include charging attendees and presenters - all fine and dandy. But how transparent, let alone honest, are you if you sell tickets to an 'educational' session, that ends up being nothing more than a paid 90 minute commercial? "That's the way its always been done..." is not your core value, is it? If you're a research company, one would think you would make a living conducting research and presenting findings. Then why host trade shows and train sales people? Aren't you selling content and hosting symposiums? Associations should derive revenue in an effort to support the improvement of their members, not chase big OEM "sponsorship". If you're an industry publication, should you pay for content, charge for the opportunity to submit content or take all the content you can, for free, and charge for advertising? There's nothing unusual about any of these models, but they've become mundane; tedious and fatiguing. Think deeply - trades shows, white papers, copier training, MpS Seminars and buzz are examples of us talking to ourselves. I've been working with end-users, IT departments in various industries, helping them reign in costs, evaluate vendors and enhance the productivity of their IT services. This gives us a great view of ourselves through the eyes of your customers. We've reviewed proposals from large MpS/MDS providers as well as some of the best known IT/VARs. We're not only listening to the presentations, we're hearing the "backstory". And they're not pretty. It's embarrassing. Our industry is in a "turnaround" period, reversing, backpedaling, and on a downward turn - if anyone tells you different, they're lying not only to you, but to themselves as well. People made this niche great. You do know teaching people how to increase a 'share of wallet' is not sustainable, right?